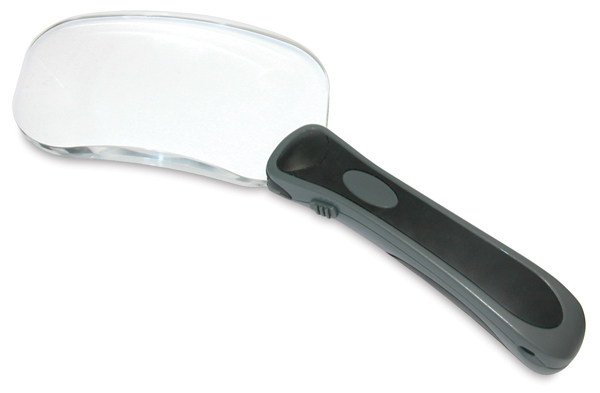 Carson RimFree LED Magnifiers are designed with comfort in mind. Their ergonomic, soft-grip handles promote a natural hand position, while their rimless, crystal-clear acrylic lenses offer wide, distortion-free viewing. Choose from Round or Rectangular models. Round features a 3½" Dia (9.8 cm) lens. Rectangular features a 2¾" × 4¾" (6.9 cm × 12 cm) lens. Built-in LED lights on the handles are operated by a convenient, side-mounted switch. Both models use a type 389 button cell battery (included) and come with a microfiber storage case. ® Carson is a registered trademark.